A vast cyclone has crashed into Australia's northern coast, bringing torrential rains and winds of up to 250km/h (155 mph). Cyclone Trevor made landfall as a category four storm and officials have declared a state of emergency in some areas. Another storm, Cyclone Veronica, is set to strike the country's west coast. 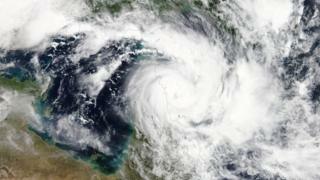 Thousands of Australians have evacuated their homes in preparation for the two potentially devastating cyclones. Destructive winds are expected, while heavy rains and large waves threaten to cause severe flooding. It is only the second time in history that two cyclones are predicted to strike the country at the same time. Tropical Cyclone Trevor hit the communities of Numbulwa and Borroloola in the Northern Territory on Saturday morning. It was downgraded to a category three shortly after making landfall but officials have warned that it is still dangerous. "There's a concern that flash flooding may occur," emergency operations official Michael Hebb told AFP news agency. The storm could bring a year's worth of rain in just a couple of days. In the biggest ever evacuation ahead of a cyclone, people living in its the path have moved into tented sites in Darwin and Katherine. Some of those who were evacuated say they are worried about what they will return to. "We are only new to the area and the house we are in isn't going to sustain the expected winds that are predicted," Emily Crawford, who evacuated to Darwin, told AFP. Emergency services and the military were called in to rescue residents from the island of Groote Eylandt, off the north coast on Thursday. The last evacuation of a similar scale was for Tropical Cyclone Tracy, which killed 49 people in Darwin in 1974. "All the locals that I've talked to say it really is one of the biggest weather events here in the last 20 years or so," Kristy O'Brien, journalist for the broadcaster ABC, told the BBC. "When you look on a map of Australia it just takes up the entire northern half. It's quite phenomenal - it's about 1,000km or so wide." Cyclone Veronica is due to hit the northwest coast of Australia between Saturday afternoon and Sunday morning. Very strong gusts are expected and the Bureau of Meteorology in Western Australia said a "severe impact" is likely. In the mining town of Port Headland, where the storm is set to strike first, supermarkets have been stripped bare as residents stockpile in preparation, ABC News reported. The town's mayor, Camilo Blanco, has warned residents to be ready for "this massive weather event" and people have been protecting their houses with sandbags. "Tie down your stuff in your yard, go next door and make sure that your neighbours are ready," Mr Blanco said.